Everyone has time to make meals in minutes instead of hours, right? One of my favorite Gooseberry Patch Cookbook's is Meals in Minutes. It is such a popular cookbook that they published a 10th anniversary edition. The cookbook is for new chefs, newlyweds, seasoned cooks, Gooseberry Patch cookbook collectors, busy mom's, dad's looking for a date night meal and more! Each page in this 222 page cookbook is chocked full of recipes and hand-dandy tips to make meal time prep look easy. Here is one of our favorite dinner time recipes. Coat shrimp and chicken with 1/2 cup salad dressing; refrigerate for 30 min. Meanwhile, prepare pasta according to pkg. directions; drain. In a bowl, whisk peanut butter with remaining salad dressing, soy sauce, honey, ginger and red pepper flakes until smooth; set aside. In a skillet over med. heat, sauté carrot, onions, chicken & shrimp in sesame oil until chicken is cooked, about 5 min. Toss pasta, peanut butter mixture and meat together in a large serving bowl; sprinkle with cilantro and peanuts. Serves 4. 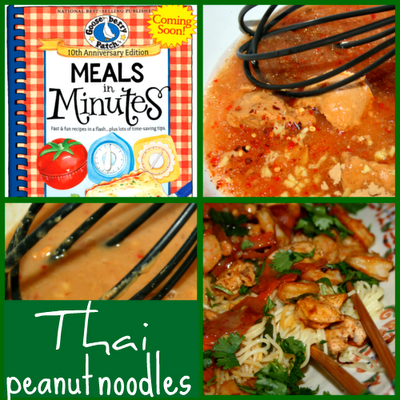 Kitchen Notes: We doubled the ingredients for the peanut sauce-it needed it! Find out more about this tasty cookbook over at Meals in Minutes Gooseberry Patch Cookbook Review.